Welcome back. It’s been a few years since I picked on sugar, and even then, I was only the messenger. When I highlighted some of the cooler campaign posters against sugary beverages (Sugary Beverage Addendum), I wrote: I’ve mentioned my dislike for sweet-tasting foods (A Healthful Breakfast), and that, given popcorn kernels, I don’t need sugary anything to earn frequent dental patient status (Dental Check-Up Time; Tooth Sleuths). But as far as I’m concerned, you can eat or drink or chew all the sweet stuff you wish. Forgive me; I’m getting ahead of myself. This blog post is about artificial, nonnutritive sweeteners, not the real thing. And I’m only the messenger again, this time alerting you to a recently published Canadian investigation of the health effects of regularly consuming artificial sweeteners that you might add or that are used to replace sugar in foods or "diet" beverages. Those 37 studies included 7 randomized controlled trial studies that compared consumption of artificial sweeteners to a control with 1003 participants for a median duration of 6 months, and 30 cohort studies that monitored the consumption of artificial sweeteners by 405,907 adults and adolescents for a median duration of 10 years. The researchers focused primarily on body mass index (BMI) and secondarily on weight, obesity and other cardiometabolic measures associated with diabetes, heart disease or stroke. The randomized controlled trials found artificial sweeteners had no significant effect on BMI and no consistent effects on other measures of body composition or on other secondary outcomes. In other words, while there was no clearly negative effect on health, sweeteners didn’t do anything for losing weight. In contrast, the cohort studies found that artificial sweeteners were associated with a modest increase in BMI, increases in weight and waist circumference, as well as higher incidences of obesity, hypertension, metabolic syndrome, type 2 diabetes and cardiovascular events. The detrimental health effects found in the cohort studies should wave a red flag; however, results of such observational studies need to be confirmed in experimental studies. Factors other than consumption of sweeteners have to be ruled out. What else, for example, were the cohort study participants eating, doing or not doing that may have affected cardiometabolic health. 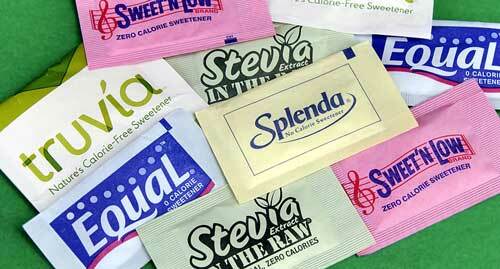 It would also be important to compare and evaluate the different types and formulations of artificial sweeteners. The one clear study result is that artificial sweeteners won’t help you lose weight. Oh, c’mon. You know you should cut back on sugar and sweeteners. Sorry about that. Thanks for stopping by.